Top Flight Watch clients love the Isobright T100 Watch from Armourlite for several reasons, First, and most important, the watch uses the Super Bright T100 rated tritium illumination. 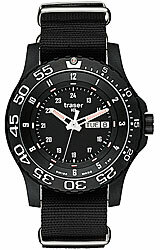 Unlike competitor's tritium watches that use T25 tritium illumination, the Isobrite watch uses the more powerful self illuminated T100 tubes of tritium. This makes it 4 times brighter than the competition! The T100 tritium glass tubes are manufactured by Switzerland’s mb-microtec and are currently the brightest and most advanced tritium illumination available on the planet! The Isobright T100 also features a virtually unscratchable sapphire glass crystal, a lightweight yet super strong polycarbonate case and a silacone diving strap. 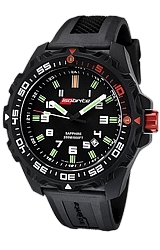 It is water resistant to 200 meters or 660 feet below sea level.